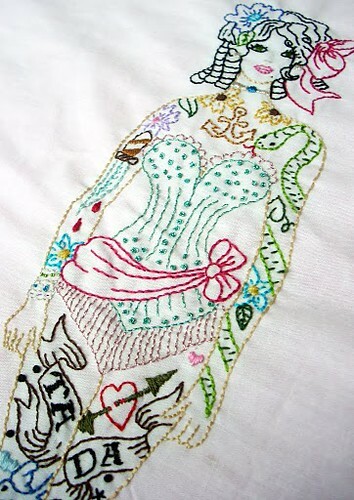 I love katiekutthroat's use of colour for Lydia the Tattooed Lady, which is part of Sew Lovely's Circus Palooza pattern sheet. 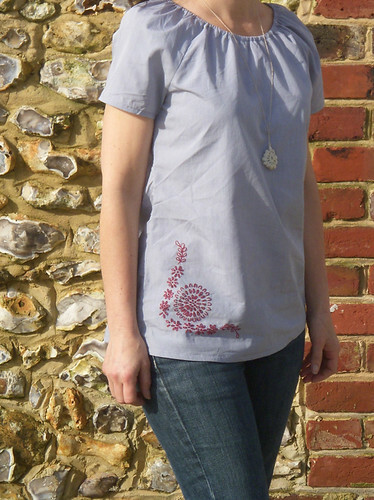 Well it's the final week of the Vintage Pattern Stitchalong and I am all done! 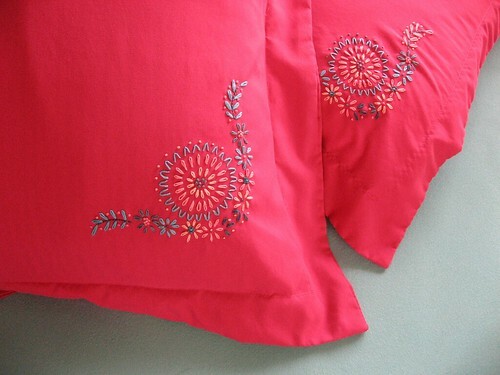 I popped in a cheesy movie this morning and put the final touches on my second pillowcase. 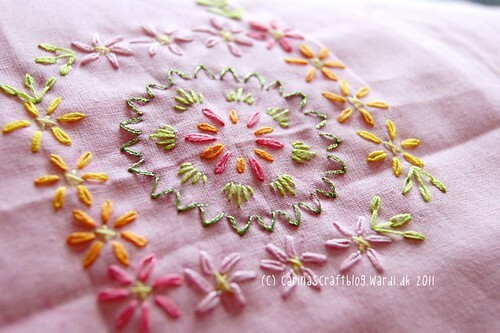 I added some extra french knots around the large flowers in the middle of the design - I used to hate French knots, but once you get the hang of them they are very addictive. 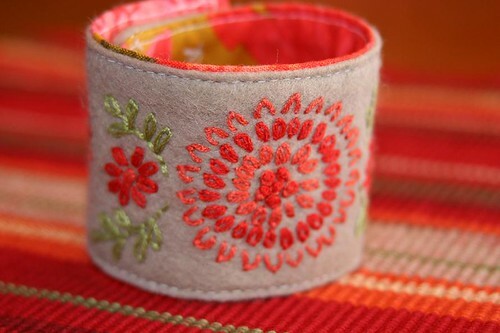 But, sheesh, next time I choose colors for a blog post to photograph, I think I'll stay away from teals and fushchias! 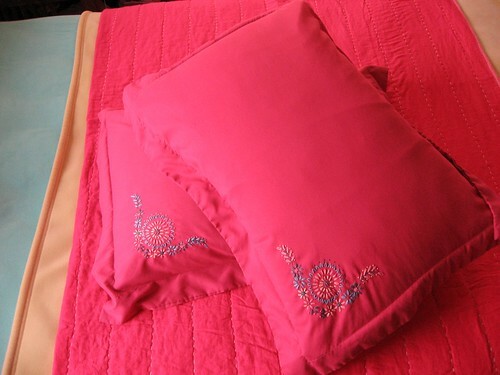 They look so pretty in real life, but it's almost impossible to capture true-to-life shades of pink and blue in photos. I did tons of monkeying around with my camera settings just to get these pics. I love how elegant the design looks in one color and it contrasts so well with the subtle pattern in her fabric - gorgeous, Ninimakes! Speaking of in-progress, I also love the details in this project by hannita - can't wait to see it finished! I wish I could have featured every single one of you - but HEY, why don't you help us make a list of everyone that took part? 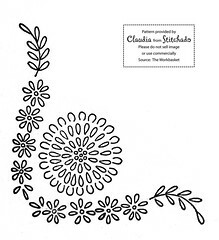 If you joined the stitchalong this month (even if yours is in progress), please leave a link in the comments! 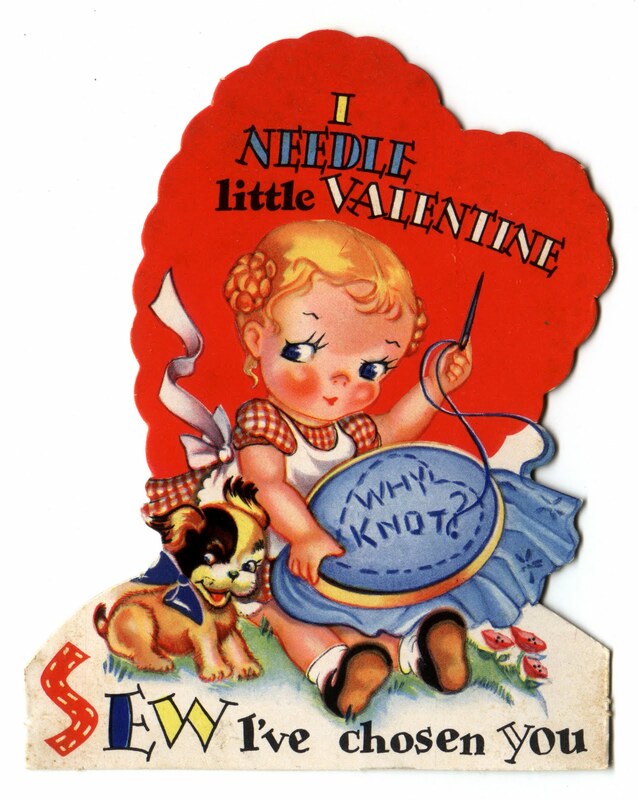 Thank you so much for stitching along with us! I hope you all had fun and were inspired, even if you couldn't join along. 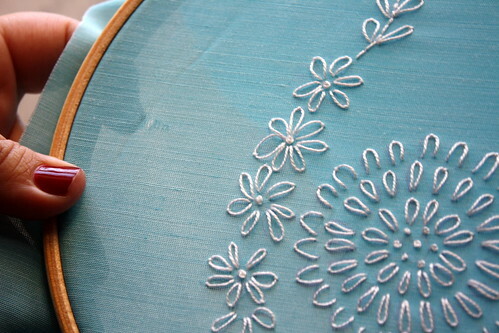 This was super fun and inspiring for me - I pulled out embroidery I literally have not touched in years. 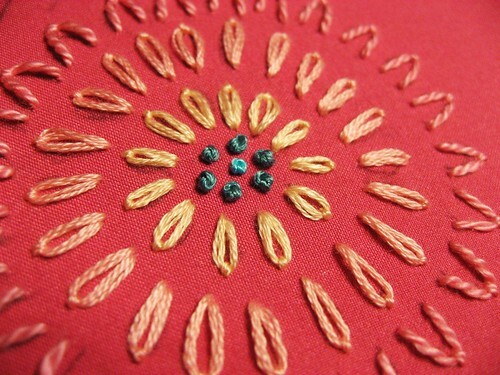 ...like a Woven Spider Wheel stitch, performed here beautifully by Olisa! 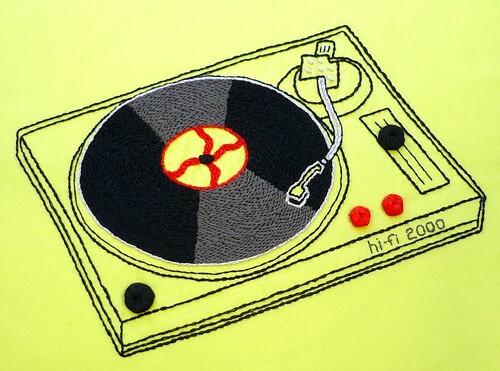 Olisa made this awesome turntable embroidery for a recent Phat Quarter swap. 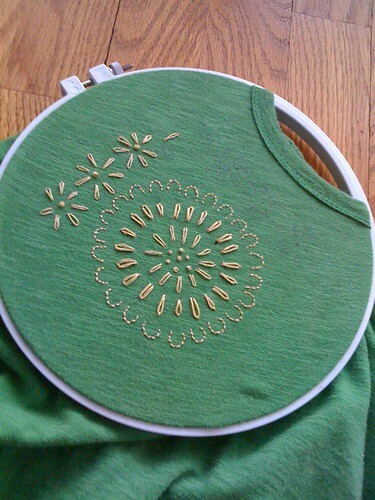 For the volume knob she used lots of layers of the new-to-me Woven Spider Wheel Stitch. 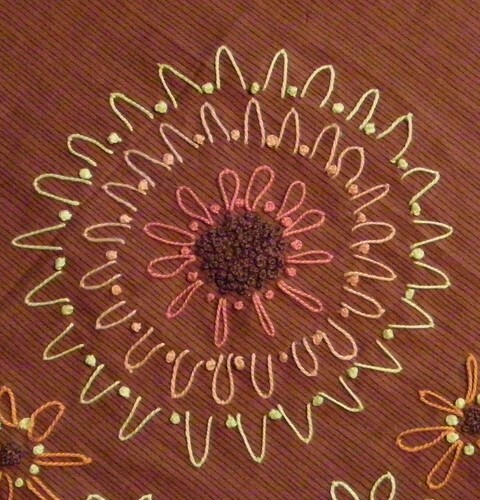 I found a tutorial for this stitch here and here. 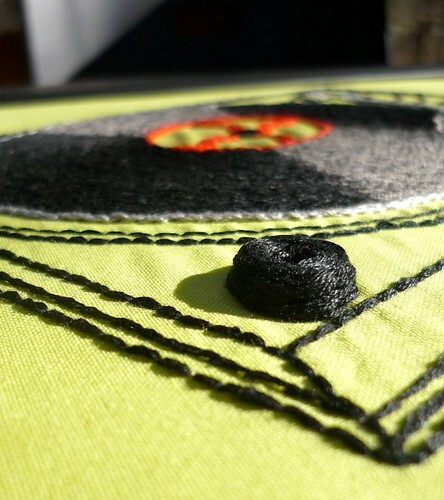 The record is made with back stitches and looks so shiny that I almost miss my old LP records. 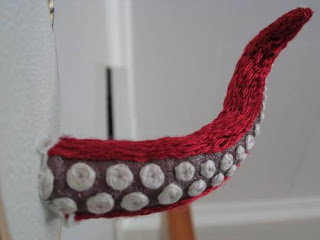 Jemimah created this amazing stumpwork for a swap. Goodness! I wish I was her partner. You can read more about her, this beautiful piece and stumpwork over at Craftster.org. Three penguins, originally uploaded by anda76. These are, like, the cutest penguins ever! With ear muffs /head phones. And their little feet! home, originally uploaded by PataPri. 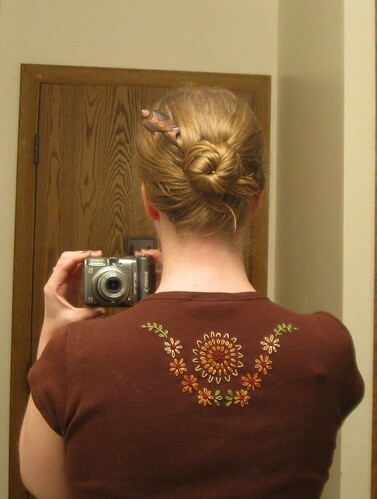 That shape above the bird is filled with French knots. 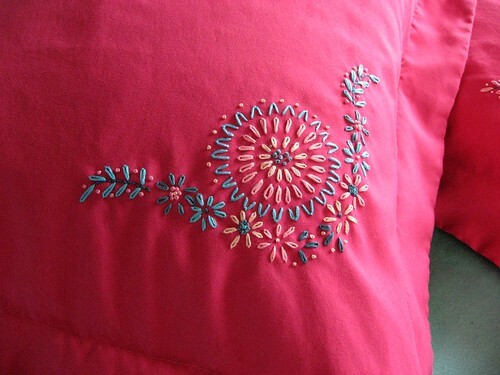 I have done some French knot filling on occasion too.. but nothing like this. This is just, you know, crazy. And, you know, pretty darn awesome. Melissa from Pink Paper Peppermints is fairly new to embroidery, so consequently I'm even more in awe of this lovely pattern, particularly the bright chain stitch lettering and chunky stripy scarf. 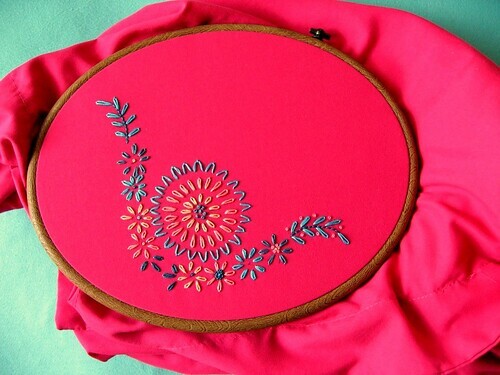 Melissa has written a great guide on how to embroider this pattern over on her blog, where you can also download the pattern. Hi everyone! 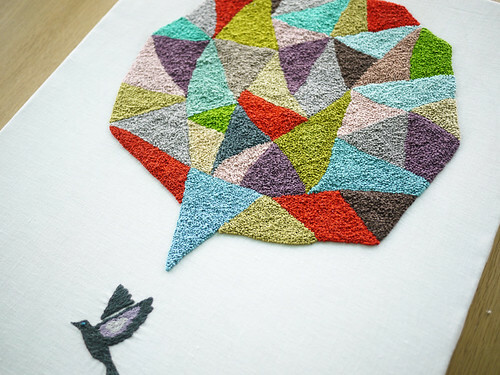 I am really loving this stitchalong idea - I love checking into our pool and these comments and seeing all the creative ways you've been interpreting this design. 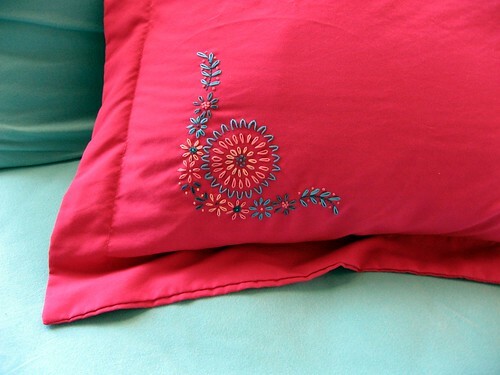 I love how you leave things out, flip the design around, the different colors you choose - this has been so much fun! 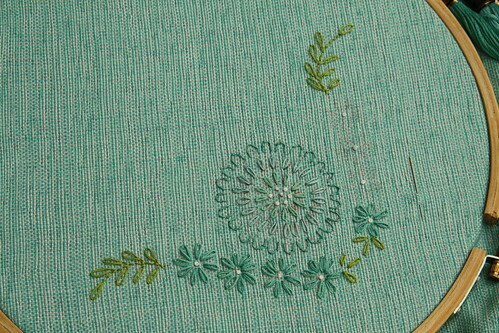 Aside from a simple back stitch in dark turquoise on the stems, I used the same 2 stitches from week 1week 2 - lazy daisy and french knot. 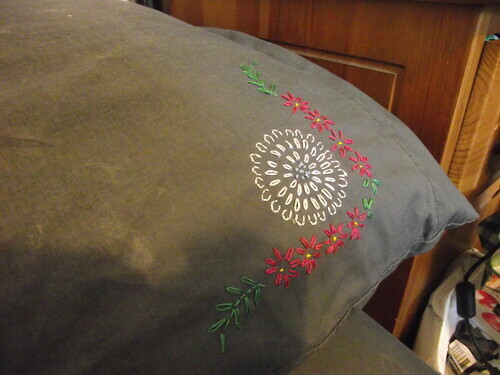 I added extra french knots wherever I wanted to add a little more texture, and before I knew it, I was done! 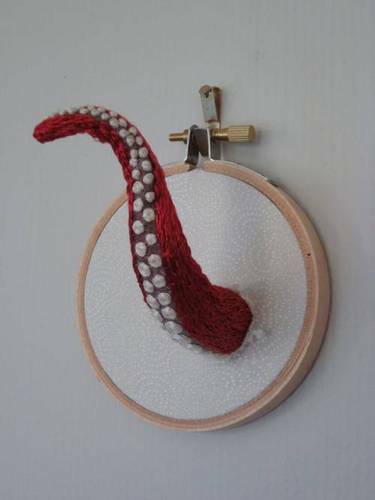 Here's what you guys have been stitching! 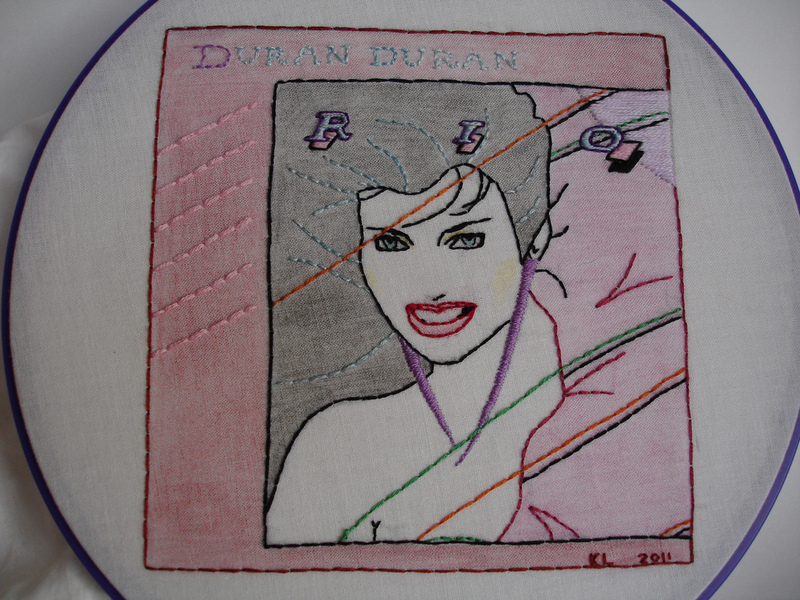 Kim thinks her stitching is a bit wonky, but I'm sorry Kim, I have to disagree - look at those beautiful stitches! 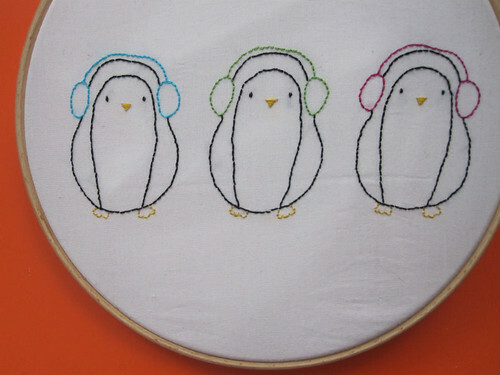 So, do we have any takers for our last week in the February stitchalong? Just add your pics to the pool, or leave a link to your blog in the comments and we might feature your work next week! 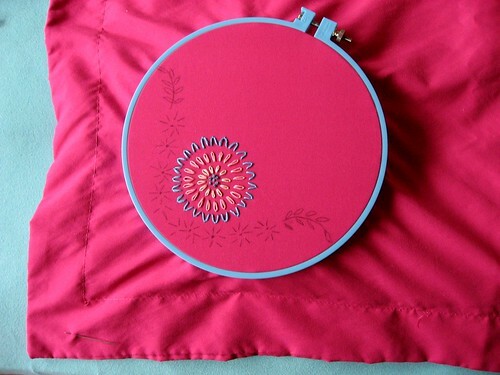 Thanks for stitching along with us, can't wait to see your work! There's not much I can add to this statement stitched by Kwgronau! 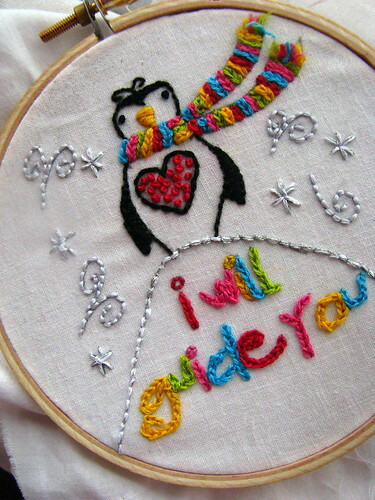 Except maybe that I recently started a Flickr Group dedicated especially to Embroidery Stitches. 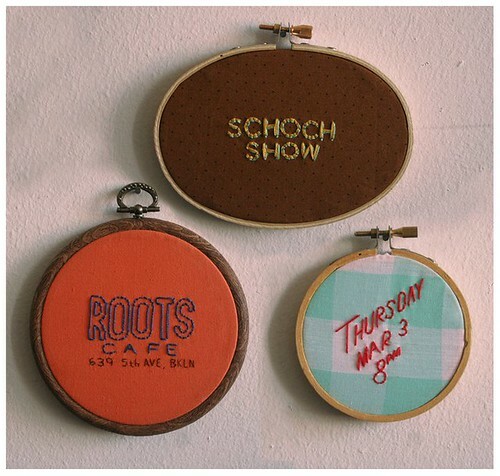 It's called the Embroidery Stitch Gallery and you can check it out here. 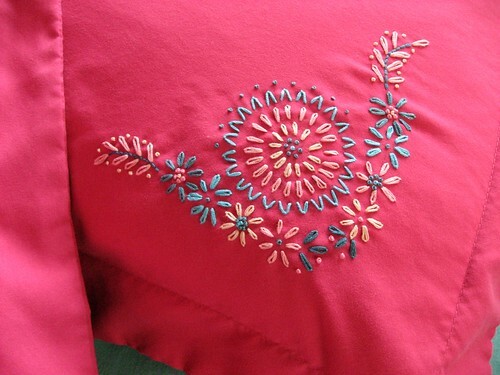 It focuses on stitches and techniques rather than finished pieces. Viva la Stitch would have been a great name for that group. 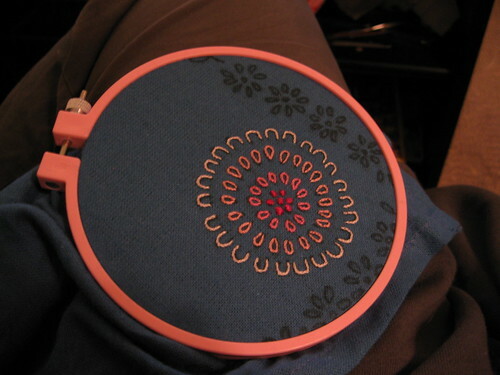 In the near future I intend to write a post (or maybe several) about fill stitching. 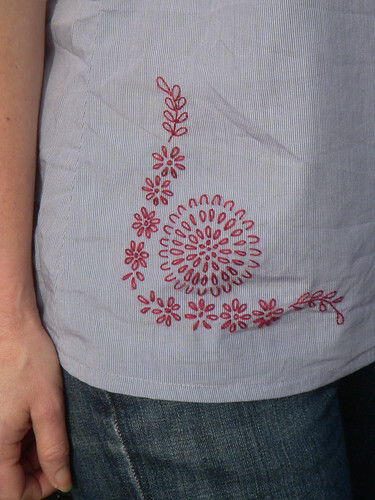 Not just about the 'traditional' fill stitches (like the satin stitch) but also semi-fill stitches (like the seed stitch) and creative use of filling your embroidered piece like the one I showcased last week. 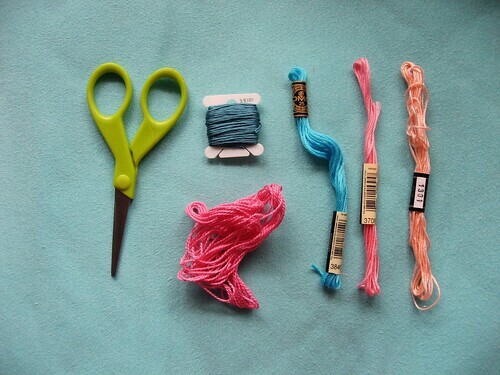 So if you have a wonderful photo posted in the Embroidery Group please tag it with FillStitch so I will be able to find it easily. I may get in touch with you to ask you about your techniques. Thanks in advance! 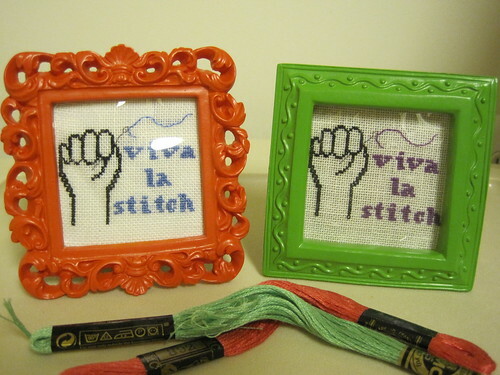 Viva la Fill Stitch! 36 Squares -- Square 24, originally uploaded by Beadgirlj. Also, that's an interesting stitch used in the hearts. 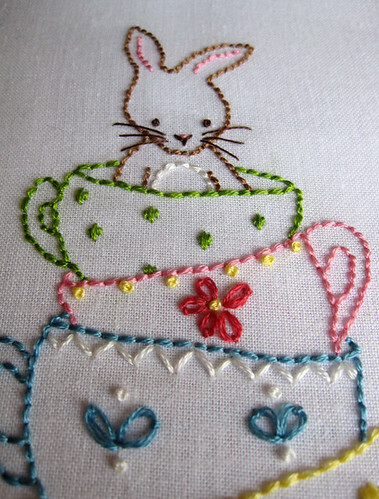 Last October, artist and illustrator Catherine Young from Bumpkin launched her first embroidery pattern, Bunny and her teacups. I've seen this pattern pop up in a few places since Christmas and I couldn't resist showing it here. 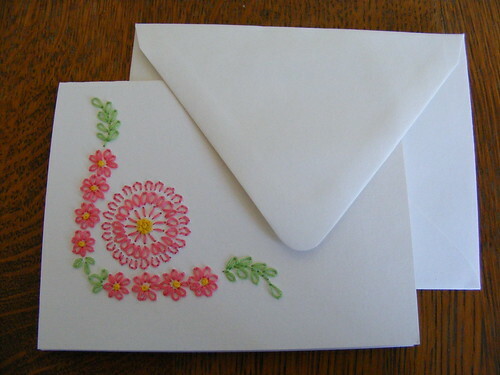 Fingers crossed for more Bumpkin embroidery patterns! Hey guys! 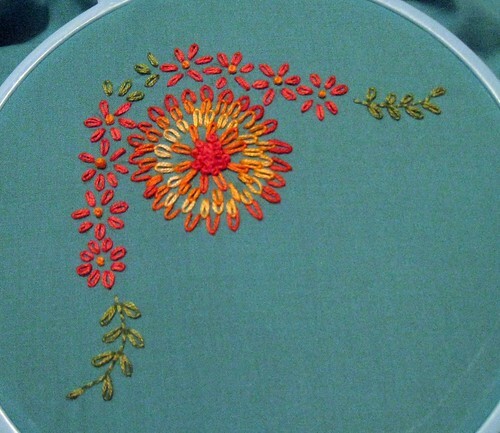 Here we are at week 2 of the vintage pattern stitchalong and I was so excited to see so many of you joining in and adding your pictures to the pool! Want to see week one? Here you go! Now, I know French knots are kind of the most dreaded embroidery stitch, but once you get the hang of them, they're not bad at all! 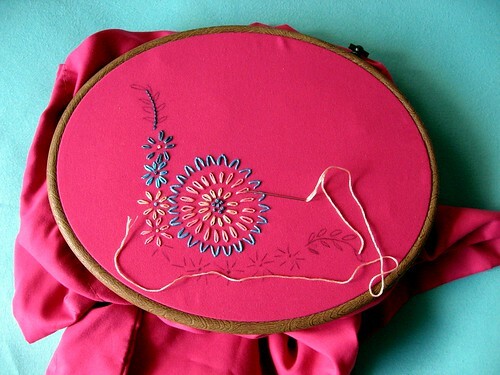 Need some step by step instructions on making the perfect French knot? Next week, I'll take you through the rest of my stitching, but before I go I want to show you some of the awesome projects you've been posting to our Flickr pool! Gorgeous stuff, you guys! If you've joined in, why not add a picture to our Flickr pool and show us? 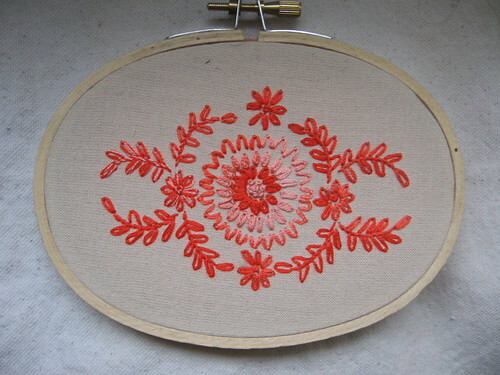 I was rather intrigued with this particular bit of embroidery by Nat (Smallest Forest on Flickr) when I spotted it in the Flick Embroidery Group. 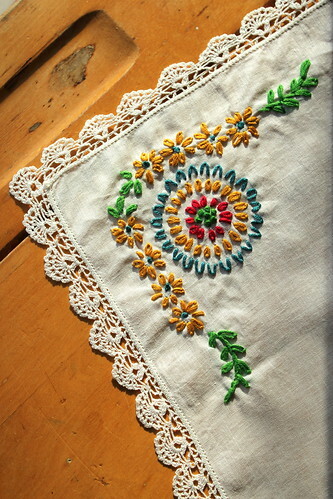 It looked to me somewhat like a Jacobean Couching Stitch, somewhat like a bunch of stacked cross stitches and somewhat like the fabric of a coat I used to have. But not exactly like anything I had seen before! 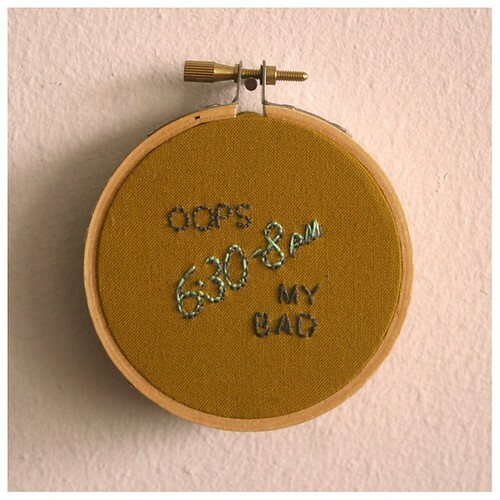 Anyway, Nat was kind of enough to share her technique with us of what she calls a Wonky Cross Stitch. Nat:"I drew a grid (freehand) with an erasable pen, and then worked a cross stitch into the grid with 3 strands, in a middle blue colour. I thought the first layer looked a bit 'thin', so then I worked a second layer of cross stitches, at 45 degrees to the first, in 2 strands of very pale shade of ice blue. 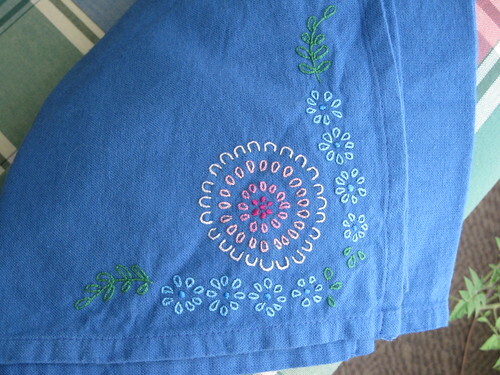 Coverage was good by this point, but the colors were washed out, and as this is meant to be a rich blue piece, I used a single strand of dark blue thread to work a grid (using back stitches) over everything. 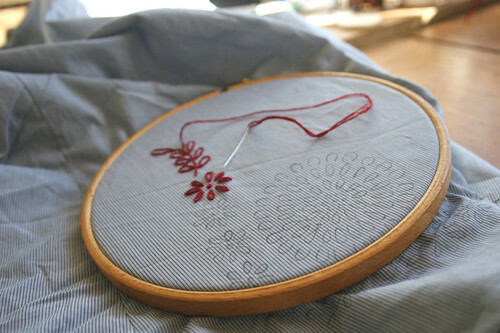 I just looked for a naturally occurring grid in the cross stitches, and picked that out with the final thread." 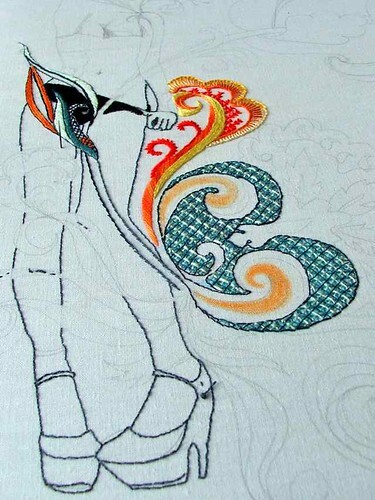 Can't wait to see this piece finished. Inspiring stuff, thank you Nat! 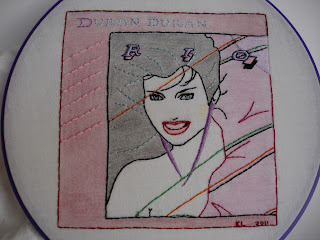 Maybe it's my teenage years calling to me but when I saw this stitched up by Vegkat I instantly tried to squeeze into my parachute pants, threw on my Ray Bans and found my old Duran Duran albums, so I could dance around the house. Her name is Rio and she dances on the sand... Eep! Where's my Tiger Beat magazine, I just have to find out what Simon LeBon's favorite color is. Am I showing my age?